instead of organic dye to etch your records for a lifetime. 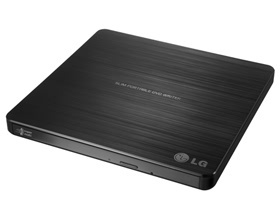 The M-DISC had been tested and proven to outlast standard DVD-R. LG M-Ready Drive is the one and only drive for buring the M-DISC and offers the best archival storage solution. A damaged disc can cause interupptions during movie playback. Jamless Play allows for the disc to continously run smoothly as it jumps over scratched, damaged and smudged areas of the disc. controls the disc read speed for optimal noise reduction. Enjoy complete freedom in use with compatible support for both Windows 8 and MAC OS. Now, no matter what type of system you choose to use you'll enjoy a convenience experience that doesn't require any consideration for compatibility.